The perfect combination of crisp, creamy, salty, and sweet. A salad you will never grow tired of! 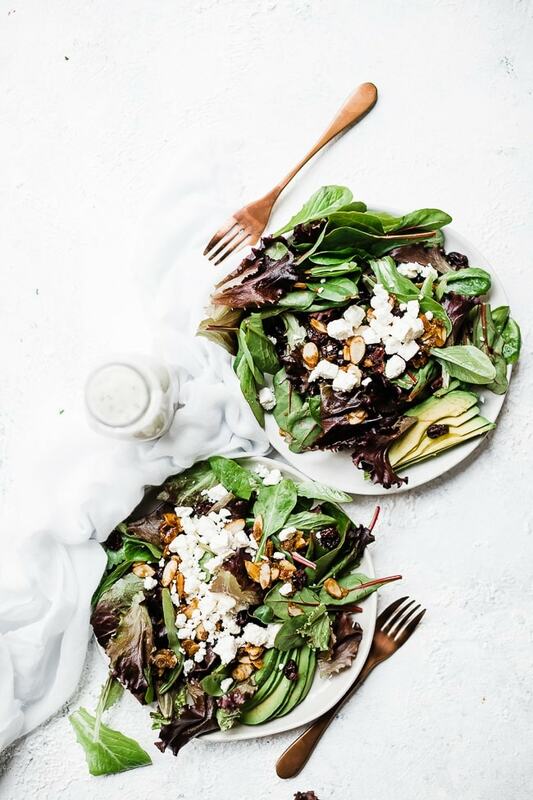 With crisp greens, creamy avocado, salty feta, and sweet sugared almonds – this Avocado and Lettuce salad comes together in minutes. What Should I Add To My Grocery List? To top it off I use my favorite store bough dressing – Briannas Poppy Seed. 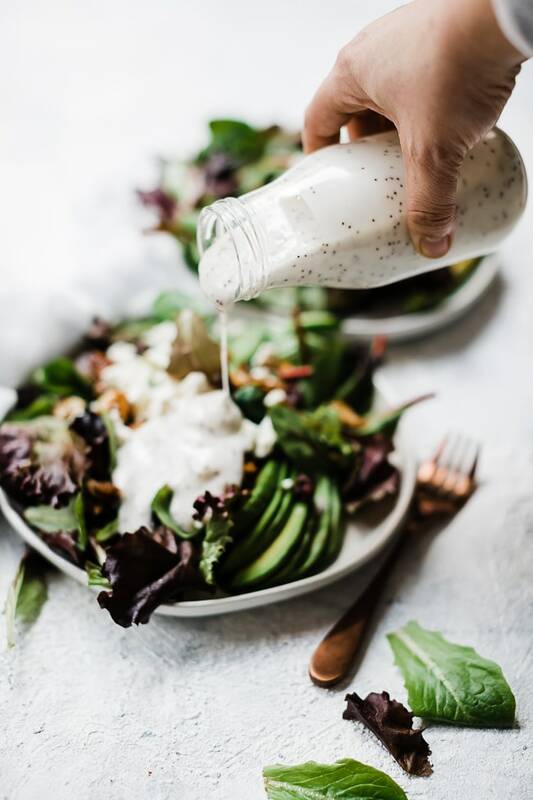 Now normally – I am not a fan of store bough dressings – homemade is so easy and so much better…but this one is pure perfection for me. 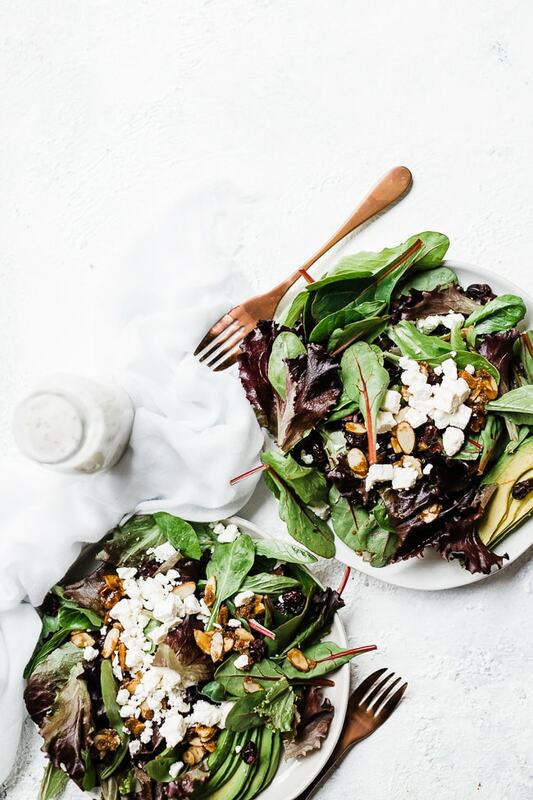 If you want to go all homemade with this salad try this recipe for this dressing. How Do I Make The Almonds? Making homemade sugared almonds is easier than you think. 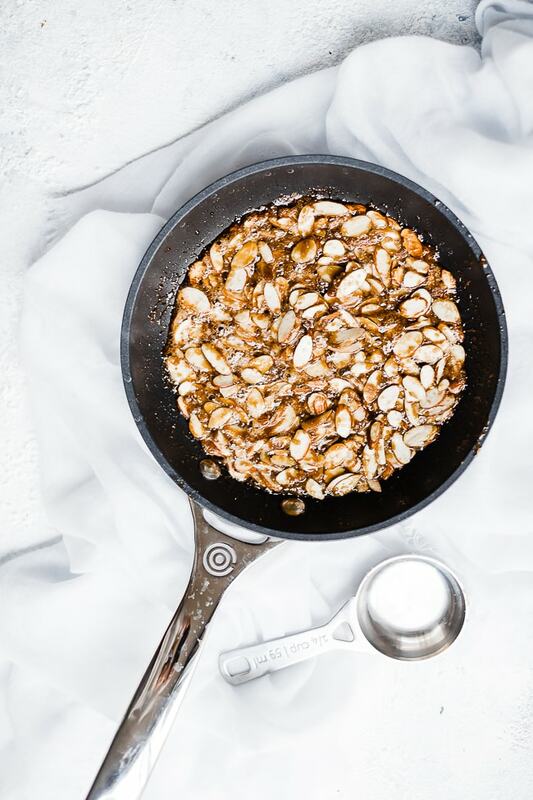 You’ll need to add butter, almonds, and brown sugar to a small skillet. Heat all over medium heat until nuts are toasted and sugar is melted. Transfer the nuts to a plate to cool. 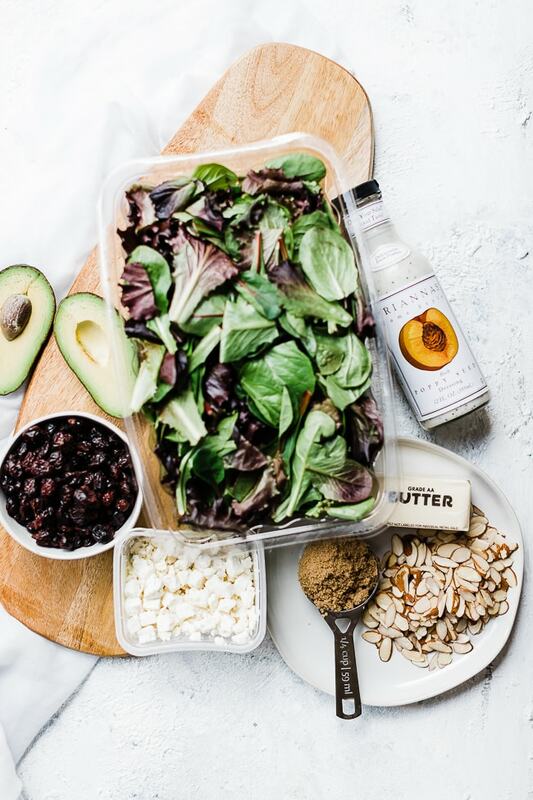 Pro Tip: Make almonds ahead of time and store in an airtight container for a quick salad. This salad can easily be turned into a meal simply by adding some sliced chicken. Or keep it vegetarian and leave out the protein. Either way it will satisfy that salad craving that summer brings. 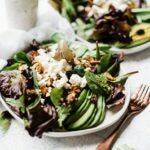 Layer lettuce, dried cranberries, avocado, almonds, and feta. Top with poppyseed dressing. I like to use spring mix in this salad. The combination of greens is beautiful and delicious. But on occasion, I have used romaine or green leaf. If other lettuces look fresher in the grocery store – I go with that. Feel free to choose the greens of your liking. If you tried this recipe or any other recipe on the blog then don’t forget to rate the recipe and leave us a comment below. You can also follow us on Facebook, Twitter, Instagram and Pinterest to see what else we’re getting up to! And don’t forget to pin this recipe to save for later. Perfect green goodness on a plate. Combine all ingredients in a small sauté pan and cook over medium heat until butter is melted. Toss to combine and cook until slightly bubbly. Transfer to a clean plate to cool. 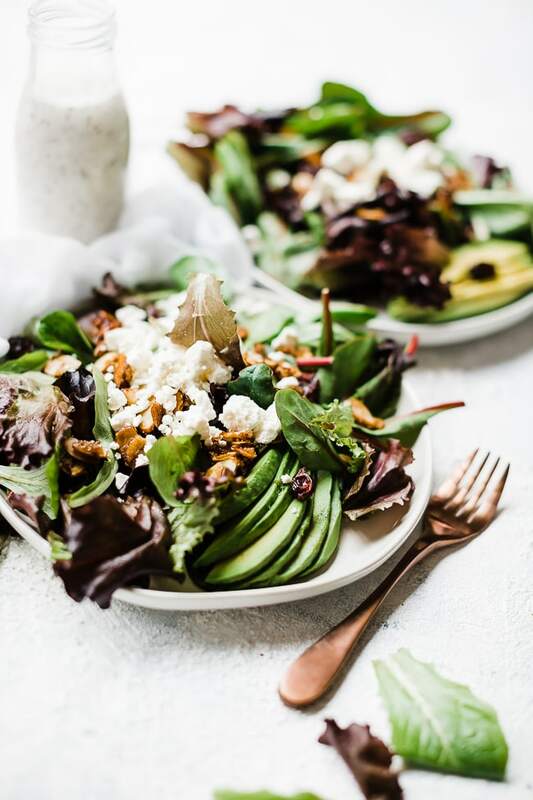 Layer greens, avocado, dried cranberries, feta cheese, and almonds on a plate. Top with dressing. Nutritional Info Is Displayed WITHOUT dressing.